The huge portrait of Martha Washington that balances the famous Gilbert Stuart painting of her husband, was painted more than seventy five years after her death. 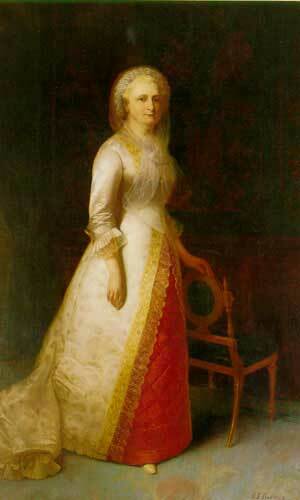 The full-length portrait of Martha Washington that hangs in the White House East Room. Before photography had advanced sufficiently to achieve artistic popularity, a portrait was the only way a person’s likeness could be preserved for posterity. The accuracy of that likeness, of course, was completely dependent on the talents of the artist. Most early presidents provided their own White House furniture, although many pieces were accumulated for the formal downstairs rooms. This also included art. Few early presidents had many portraits painted, let alone specifically for the house itself. First Lady portraits, if there were any, were reserved for their families and heirs. The famous George Washington portrait “saved” by Dolley Madison in 1812. The most famous of the early White House portraits is the one attributed (and occasionally questioned) to Gilbert Stuart, acknowledged as one of America’s premier portraitist of the eighteenth and early nineteenth century. What is definitely unquestioned, is the fact that this was the portrait rescued by Dolley Madison just prior to the burning of Washington in 1812. It is an heroic painting, in the sense that it is literally larger than life. During Madison’s presidency, it was hung in the state dining room. Following the rebuilding of the White House, it was placed next to the fireplace in the great East Room. Eliphalet Frazier Andrews, an Ohio artist, had become good friends with President and First Lady Hayes. After the Civil War, Rutherford B. Hayes, lawyer, Union general and Republican congressman, was elected governor of Ohio. His fellow Ohioan, Eliphalet Frazier Andrews (1837-1902), was engaged to paint the portrait of the popular governor. Andrews and Hayes became good friends. Once Rutherford Hayes became president is 1877, via a fractious and most likely corrupt election, both the President and the First Lady were dedicated to maintaining an irreproachable image. 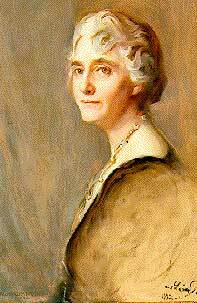 Mrs. Hayes, the first FLOTUS to have had the benefit of higher education (Wesleyan Female Seminary), loved history. She also loved art. Lucy Hayes (1831-89) suggested that the White House acquire portraits of former presidents, and efforts were made to solicit “donations” from family descendants. The response was not overwhelming. The families generally wished to retain possession. As a compromise of sort, it was decided that copies of the original portraits would be made. Copying art was a fairly popular medium, and some copies were indeed excellent. Some copy-artists were in great demand. Eliphalet Andrews, the Ohio artist with a solid reputation as a copyist and artist, would copy portraits of Thomas Jefferson and Andrew Johnson specifically for the White House. It was Mrs. Hayes who decided that our first First Lady should also be immortalized for the White House. Gilbert Stuart had painted a portrait of Martha Washington in her older years, but it was merely a “head and shoulders” image. The new First Lady wanted a portrait to balance the famous George Washington. Andrews was summoned. His thought (perhaps with influence from Lucy Hayes) was not to portray Lady Washington as an elderly woman, a la Stuart. But earlier portraits of a younger Martha left a great deal to be desired. Andrews had a big challenge. The best, and best-known portrait of Martha Washington was painted by Gilbert Stuart when she was in her mid-sixties. Drawing heavily on the Stuart portrait of Lady Washington in 1796, when she was sixty five, the artist and First Lady determined that they wanted to portray her about ten years younger, when she was about to become the first First Lady. This would not be a “copied” portrait. There was little to copy other than her aging face, but it was a Victorian age, romanticized and elaborate, and liberties were part of that effort. First Lady Hoover placed George and Martha flanking the East Room fireplace, where they have hung ever since. Martha Washington is indeed larger than life, in a full body portrait. The head does resemble the Stuart portrait; Andrews was a skilled copyist. And it does appear that a decade was “removed.” The rest, however was all Victorian imagination. Her gown would never have existed in Lady Washington’s time. Nor would the style of the background chair. 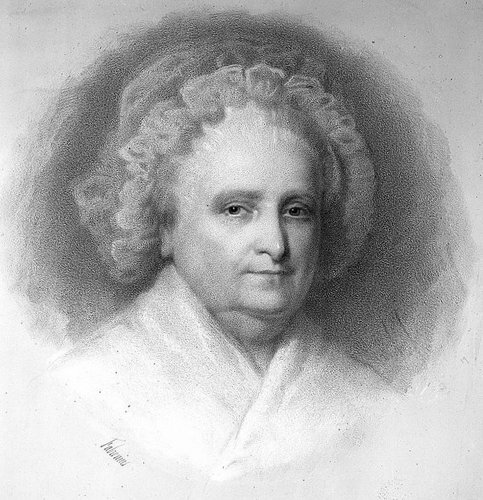 This heroic sized portrait of Martha Washington is the only portrait paid for by federal funds. Subsequent President and First Lady portraits have been privately subscribed. It would fall to First Lady Lou Hoover some fifty years later, to have George and Martha flanking the East Room fireplace, where they remain to this day. First Lady Lucy Webb Hayes was the darling of the Woman’s Christian Temperance Union, a group militantly dedicated to prohibiting the sale and use of liquor. Mrs. Hayes never formally joined the group, although her personal inclinations tended to echo their cause, albeit not militantly. She is credited (maybe, maybe not) with banning spirits in the White House during the Hayes administration. Whether or not it was her influence, the bottom line was that the executive mansion was definitely dry. The “heroic” Lucy Hayes was the first First Lady portrait painted expressly for the White House. FLOTUS portraits are now a tradition. As the Hayes administration was ending, the WCTU wanted to honor her, and asked what type of gift she would like to have. She suggested that her portrait be painted and donated to the White House. It would be the first portrait of a First Lady specifically commissioned for that purpose, and a tradition that continues to this day. 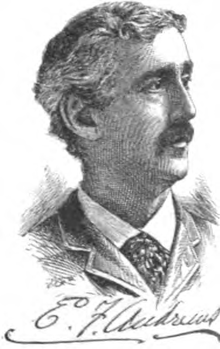 Eliphalet Andrews was not the artist of choice. Lucy Hayes’ portrait was done by Daniel Huntington, one of the foremost portraitists in the country. It is also an heroic piece, over seven feet high. Lucy was five foot three. This entry was posted in A POTUS-FLOTUS Blog, George Washington, Nifty History People, Rutherford Hayes and tagged American artist Eliphalet Andrews, American history, Daniel Huntington, Dolley Madison, Eliphalet Frazier Andrews, Feather Schwartz Foster, First Ladies history, First Ladies portraits in the White House, First Lady Lou Hoover, First Lady Lucy Hayes, First Lady Martha Washington, George Washington, GIlbert Stuart, Gilbert Stuart's portrait of Washington, history, MArtha Washington, President Rutherford B. Hayes, Presidential history, Presidential portraits in the White House, Rutherford B. Hayes, the East Room of the White House, US history, White House history, Woman's Christian Temperance Union. Bookmark the permalink.